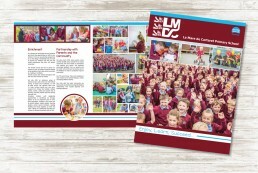 La Mare de Carteret Primary School needed a new folder to present to new parents, showing all their wonderful school was about. I had designed the old folder in about 2008, and as most of the children were now well into high school, it was decided to take some new images and give the folder a new look. The result is an impressive, glossy folder that really brings across the vibrancy of La Mare.